In this article we’ll give you a few tips about the 7 best points from which to admire the Eternal City, the must-sees you cannot miss. Ready to climb? The Gianicolo is a hill in the Trastevere district overlooking the west bank of the Tiber. You may reach it taking a pleasant walk through a park often frequented by couples in love. The area is where Giuseppe Garibaldi and other Italian patriots attempted to defend the Roman Republic from the French and the Pope who wished to repossess the city. There are in fact a number of statues to commemorate the heroic feat. 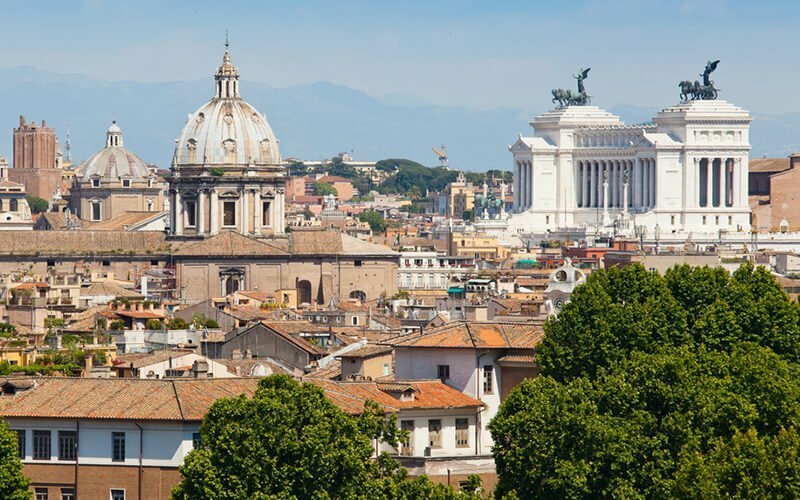 From this vantage point, you’ll enjoy one of the best and better-known views of Rome and if you happen to be there at noon, you’ll hear “the firing of the cannon,” a tradition commemorating the Roman Republic. From Emperor Hadrian’s Mausoleum to the Popes’ stronghold, St. Angel’s Castle has gone through a thousand lives. There is a stunning view from the top terrace just under the statue of the celebrated angel who lends his name to the building. From here, you’ll be able to observe the city from some 3 vantage points, look over the roof-tops of the most important monuments and appreciate the close-up of a special perspective. It overlooks Piazza del Popolo and you may reach it by going up a staircase from the piazza. Every day it bustles with youngsters and people of all ages that go up there to enjoy the unique scenery of the Capital. The view of St.Peter’s dome is truly beautiful and from here you may wonder into Villa Borghese to admire the fountains and statues. At sunset, the light over the roof-tops is simply breathtaking! Would you like to see the Eternal City from one of its naturally highest vantage points? Then ‘Mount Mario’ with its 139m is just the ticket. From the Zodiaco, a beautiful promenade running the borders of the so called “Lovers Avenue”, we can enjoy a suggestive and romantic view even celebrated by Wolfgang Goethe. The Astronomy Observatory lies just at the top of it, suggesting perhaps, that we should never forget to look upwards, towards the starry skies. Located inside the Savello Park on one of the 7 hills of Rome the Aventine, the garden unsurprisingly takes its name from the numerous orange trees planted in its grounds. The perfume from the blossoms is quite something to be experienced in the spring. The place has a certain magic to it, an oasis of peace, offering a more discreet view but none the less charming. Just a short walk away, in the Piazza dei Cavalieri di Malta, you should check out the “Magic Key hole” which will allow you to peep at the dome of St.Peter’s in the distance… the perspective is quite amazing! Should you find yourself in the vicinity of Piazza Venezia, then you shouldn’t miss going up to this terrace located right above the Vittoriano, the sizeable white marble building dedicated to Victor Emanuel II King of Italy and to the fallen soldiers of WW1. You may take a lift up to the terrace to enjoy beautiful 360° views. The Dome may only be reached by entering the Basilica and hiking diligently up the 537 coiling steps to the top. Once you’re up there, your eyes will be able to scan the four cardinal points as well as peek into the Vatican to catch a glimpse of the charming gardens and buildings. Who knows…you may even see the Pope! Why not reach all the views described aboard our Buzz buggies or our iconic Vespa, the pre-set GPS will take you the shortest route there. Choose from our set itineraries or go exactly where you please!